I'm so excited that it's Perfect Picture Book Friday because this week I found a brand new book that is so good I can't wait to share it with you! Opening: "A is for Apple. B is for Ball. C is for Cat. D is for Moose. "Moose? No. Moose does not start with D. You are on the wrong page." Brief Synopsis: (from the book summary) "Moose, terribly eager to play his part in the alphabet book his friend Zebra is putting together, behaves rather badly until Zebra finds a spot for him." Links To Resources: This book was released on February 28 (I told you it was brand new!) and try as I might, I couldn't find any activities online! No coloring pages or anything - nothing on Kelly's or Paul's sites. So here are a few other things to try: Alphabet Activities, More Alphabet Activities, How To Draw A Moose, How To Draw A Zebra, have kids "direct" their own alphabet book - what would they choose to illustrate each letter? Now have them do the illustrations! Why I Like This Book: Well, it's just perfect! It's so simple, yet so fun! It starts out as you'd expect an alphabet book to - A is for Apple. But by the D page things have already turned topsy-turvy. D is not for moose! But Moose is so eager to get involved he can't wait (and what child can't relate to that?!) On the E, F and subsequent pages he wonders, now? now? He bumps into Elephant, He sneaks in around the edges. He runs along the label of the jam jar. K. L. And at last, M!!! But Moose is in for a rude surprise... followed by angry Moose.... followed by sad Moose... until in the end, Zebra finds a way to make it right, leaving Moose so delighted that on the end papers he begs, "Can we do it again?" The story plays on the alphabet's predictability/familiarity by going in an unexpected direction. The art is absolutely fabulous, chock full of humorous detail, making the most of every opportunity for fun. Do you want to know how much I love this book? I am buying a copy for my granddaughter! As you all know, as a small thank you to all of you who work so hard on Perfect Picture Books, I randomly pick a winner from the PPB bloggers each month to receive a prize - you get one entry for every book you add in the month. November's winner was Stacy, December's winner was Clar, and January's was Miranda. This month 32 bloggers added 112 books (not counting me)! Thanks to the wonder that is random.org I am happy to announce this month's winner is Jackie C of The Castle Library! Jackie, please email me (handy button in sidebar) and let me know which prize you'd like. I always have a random mixed bag of goodies lying around which changes from month to month... this month's choice is hmmm.... you probably don't want raccoon nest material... or those old socks... Here! How about one of the following: a copy of Ann Whitford Paul's book Writing Picture Books, or a copy of Anne Mazer and Ellen Potter's book Spilling Ink, or a copy of The Other Side by Jacqueline Woodson, or a signed copy of April Fool, Phyllis! from yours truly. Your pick! Just looking at the cover makes me smile! I feel bad for Moose, but something tells me everything will work out just fine! Your granddaughter is so lucky! This sounds like a great book! And what a better stamp of approval than a gift for the grandchild? Awesome! I will add it to the ever growing list. Congratulations to Jackie C! Wow, 32 participants? That's wonderful! YAY for Jackie C! Great book Ms. Hill! It sounds REALLY funny! Ithink this is a book our family should have (I think Josie will like it too) :) I'm glad Zebra makes things right! YOu seriously will love this one, Robyn! It's everything a picture book should be, and as writers it has A LOT to teach us. The whole thing can't be more than 200-250 words (not sure, I didn't count) and it's just the perfect package - entertaining, good message, short and sweet! Love your pick today Susanna, it sounds like a great lesson for everyone and a lot of fun. p.s. With the school run coming up and then dog walk and play group, I won't know for ages if my link worked, but I'll check again as soon as I'm back. Have a great day! I'll check it for you right now and make sure it's up! It is a very fun book! And thanks! This book sounds funny! You're the second person I've seen talk about it this week, so it's definitely going on my to-read list. I have to agree that it is rare that a picture book just grabs me first read and I have to holler to everyone about it! I trust your hollering and think I would have been like Moose, wanting to get onto every page! And here I thought I was beating everyone else out of the gate with a book that's only 3 days old! :) Can't wait to see what you chose this week! It's so clever and fun. On the S page, when he's mad, he draws antlers on the snake :) The whole book is full of fun details like that! I must by this book for all my nieces and nephews!! It features a zebra!! But also because it sounds really cute and enjoyable. I love your picture book recommendations, Susanna! This just appeared in my inbox from Amazon yesterday and I thought it looked delightful! Poor Moose - I'm glad he found his place. (He draws antlers on the snake? I'm SOLD!) Thanks for giving me a peek inside...this one is right up my alley (and also on the "why didn't I think of that" list). Congratulations to the Queen of the Castle for her win! This book looks like it's right up my alley. I saw mention of it somewhere else this week, but I can't remember where. The cover looked cute and your review has confirmed that cute goes beyond the cover. It's on my list! I returned to the top to see if the book was written and illustrated by the same person. After I confirmed it was not, I'm having to resist the urge to go buy it now to check it out vs. reading other ppbf entries. Congrats to Jackie C.
What a funny concept, can't wait to read it to the kids. Thanks for sharing! Sounds like a fun one. Wonder how many years it will take for my small library to get it. Oh, I just KNEW today's list would include a BUNCH of Dr. Seuss books. I was right!!! Funny. It reminds me of "Kipper's A to Z" where they have to keep telling the eager zebra, "No, not yet!" I haven't read that one - I'll have to check it out. Maybe this isn't as original as I thought! I'm a big fan of the library, but I don't think you'll be sorry if you buy this one! Enzo will love it, and it has a lot to teach us as writers too! Congratulations, Jackie, for winning the PPBF blogging fun! 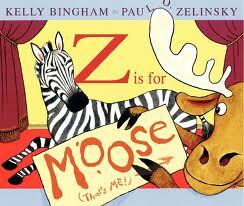 Z is for Moose sounds delightful. Wish I had a grandchild young enough for this. Mine is almost all grown out of picture books (but we still read them out loud to him), that's what grandparents can do. WOW...hot off the presses. :) This looks like a great alphabet book...kids will love the humor of Moose not being able to wait for his turn. :) I think they will definitely relate to that! Boy you are bouncing off the pages with excitement. It sounds absolutely delightful. What a great lesson that all kids can relate to. Very creative. Love to find a brand new book, but also find that it's hard to find a resource. But, your activity suggestions are great! If you haven't seen it yet, Vivian, I think you'll really like it! And thanks for your kind words about PPBF - I so appreciate everyone who is involved, and we're gathering such a great resource! Thats a lovely book Susanna and like Pat below me said you are certainly bouncing off the walls with this one. "Everyone quick go out and grab it".... there, I holled it out for ya..... lol. It looks like a fun read as well. Oh, this one looks cute. Love the title, too, so clever. Picture book writers sure are a smart bunch :-) Thanks, Susanna! And congrats to Jackie on her big win! p.s. my link didn't seem to take the first time I posted it, so I just posted it again and now can see it at number 23. Hope I didn't duplicate anything! Susanna, 32 bloggers and 112 books! That's awesome! Loving this book already and I've got a Barnes & Noble gift card burning a hole in my pocket- now I now what to do with it! There's another book I've got my eye one, but am waiting to feature it next week! Here's the link to this week's story on MyVerona. I love A to Z books. The more clever and witty the better. This one sounds like just the ticket! I know :) I am still part child :) Maybe why I like to write PBs :) Sorry about your posting troubles. I sent you an email. We shall find a way! Well, it's probably cheaper than buying the book, but seriously? You have to pay? Where do you live? My library you just go online and if they don't have the book they get it from one of the other libraries in the system - no charge - and you pick it up from your closest branch! This sounds like a really fun one. I'll have to check it out! Grabbed my virtual cheesecake and loved this PB choice. Yes, I can see children loving this and relating all too well to Moose's anxiousness to be "in it" already. Wow! I loved your synopsis. That book sounds amazing. I might just read it! I wish my kids were younger so they would read picture books again. The closest we come to it is early chapter books with pictures. yes, I saw that yesterday and linked to it on my PPBF post! I think you'll enjoy it. Certainly, as a writer, it is both inspiring and humbling to see such a simple idea executed so well. I know. Sigh. They have that habit of growing up! I think you'll like it even if you're "too old" for PBs! I'm not crafty at all, either! My mom makes gorgeous quilts for the boys since I am an inept crafter. What an adorable idea! I'll have to check it out for sure. Hi--Just wanted to mention that I've never read, seen, or heard of Kipper's A to Z. But I'll go check it out now! And thank you to everyone for such wonderful praise and support! I hope you all enjoy the book! Hi Susanna, I just saw your review and am so thrilled and honored that you liked the book so much. Thank you for the delightful review and for letting everyone know about Moose. I hope everyone here enjoys it, too! I actually wrote this book for my son when he was learning his abc's and I couldn't find any "funny" picture books in our library...so he asked me to write him one. That is how Moose came to be....eight years ago! My son is now 13 but I tell him this is still "his" book and it was worth the wait. I am so delighted with Paul's artwork and feel so fortunate to have shared the book with him. I am very proud of Moose and I hope everyone loves him as much as you do! Best wishes to everyone...and thank you again. This sounds like a great one for my K class! Thanks Susanna! Oh I love this book so much. Genuinely made me laugh out loud on first read! Isn't it wonderful?! I love it. So funny and so cleverly done. Thanks so much for stopping by, Caryn! This was a hilarious book and DD loved to see how Moose was so desperate to "get in"
Sounds absolutely delightful! Moose reminds me of my 3 year old! I'm so glad you shared about this book at Booknificent Thursday! Hope to see you again soon. Susanna, I just wanted to take a second to thank you for visiting and commenting on so many links from Booknificent Thursday (and mentioning that you came from there)! I really appreciate it and it helps to foster the kind of community we're trying to build!